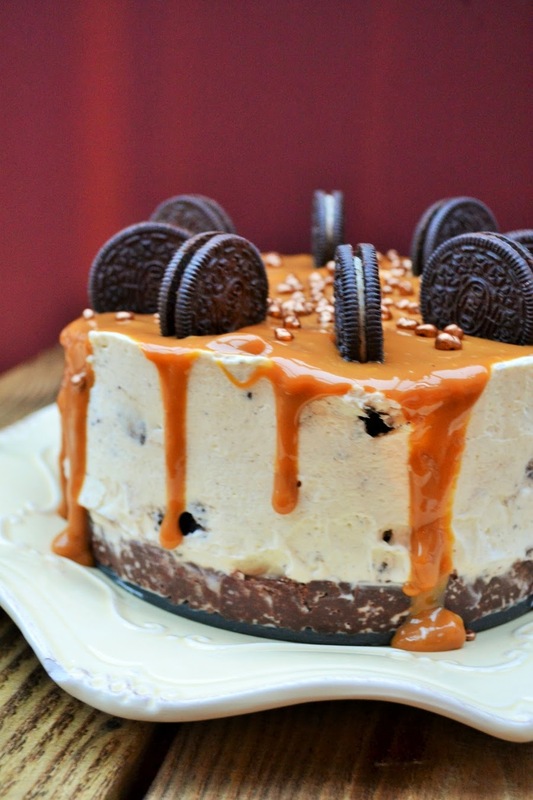 I admit it took me a while to make this vegan no-bake oreo and caramel cheesecake, but I did it. I made the original deep Oreo and Caramel Cheesecake last March and then I made another no-bake cheesecake for my last cake club and I was asked for a vegan version, so it's been on my mind since then. I wanted to make a vegan cheesecake, but I didn't want to use tofu, so I was thinking about it for a while. 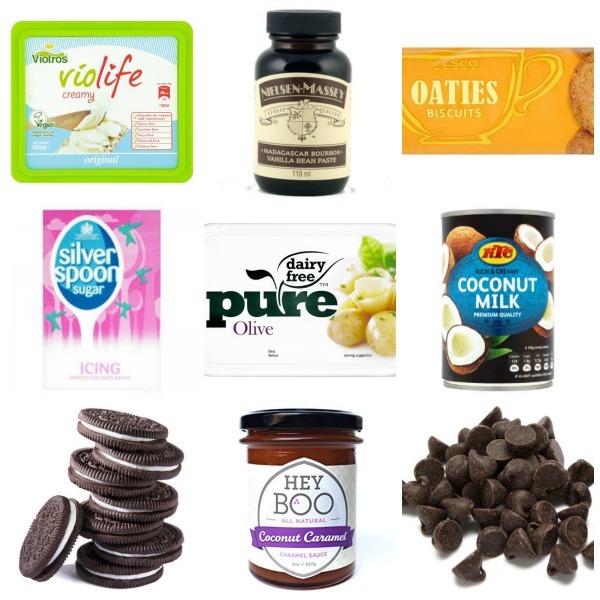 Would I use vege-gel, aquafaba or coconut milk? I decided coconut milk would be my replacement for double dream and it worked like a dream. Do you know the wonderful thing about coconut milk? It's a great vegan and dairy free alternative to whipped cream. Pop a tin of coconut milk in the fridge overnight. Next day turn it upside down and open the tin. Pour the coconut water into a glass to use in smoothies and scoop the thick cream into a bowl. Add some icing sugar and whip it with a hand or electric hand whisk until it's thick and stiff like whipped cream. You can use it instead of whipped cream on trifles, in mousse, in cheesecake or served alongside pie. Try adding some vanilla extract while you are whipping it and it will taste even more awesome. I have to admit I didn't make my own caramel. I found a wonderful vegan caramel in M&S called Hey Boo. It's also made from coconut milk (isn't everything these days?). It's rather pricey, so just a drizzle and a few Oreos and dark chocolate chips to finish the cheesecake off. For the biscuit base I crushed Tesco Oaty Biscuits. They are labelled vegetarian, but are actually suitable for vegans. I crushed them and mixed them with melted dairy free spread. And yes those are the ingredients and no it's not a healthy recipe. It's a treat. An occasional treat! I do hope you try it. It's not as firm as my dairy style cheesecake, but it holds it's shape nicely and tastes great. Graham was in seventh heaven having such a decadent dessert to eat, bless him. He also had to fight off Cooper who wanted to work his way through it. A dairy-free, no-bake cheesecake. 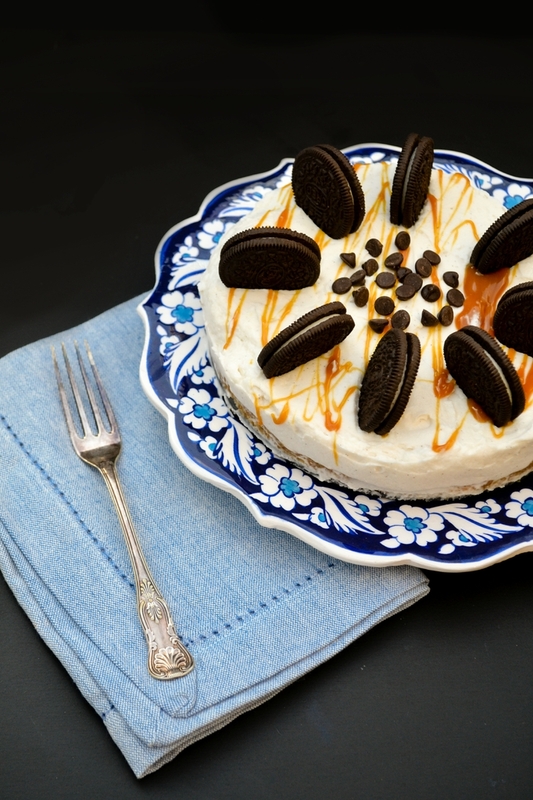 A crunchy oaty base topped with a creamy coconut and vanilla cheesecake filling and finished with a drizzle of dairy-free caramel, Oreos and dark chocolate chips. A really luxurious dessert for vegans and those on a dairy-free diet. 2-3 tbsp coconut water to loosen up the mixture a little, if it needs it. 1. Line a cake pan with greaseproof paper or use baking spray. 2.Melt the dairy free spread. 3. Crush the oatie biscuits until they are a fine crumb (I do this with the end of a rolling pin, but you can use a food processor) then stir in the melted spread and press the mixture into the cake tin and pop in the fridge. 4. Take the tin of coconut milk out of the fridge, turn it upside down and open it. Pour the coconut water into a glass (set aside for smoothies) and whisk the thick cream with the sugar and vanilla paste until thick. 5. Beat the cream cheese until soft, then whip into the whipped coconut cream. 6. Pour into the cake tin, smooth the top put it back in the fridge for a few hours. 8. Decorate with Oreos and chocolate chips. A slice now would be perfect! Oh WOW this looks spectacular!!! Thank you so much for taking the time & effort to veganise your original recipe. It's really appreciated! I never knew M&S did a vegan-friendly caramel, so I definitely need to seek that out! The caramel is amazing Shaton, but £6 for a teeny little jar. As to the coconut milk, I've heard other people say it didn't work, I guess I've just been lucky so far. Good tips through. A vegan cream tea sounds marvellous!! Oh and I've heard the light or low fat cans of coconut milk definitely don't work. Oh. My. Gawd! How perfect is this? I love it... especially as I wouldn't even have to veganise it. Brilliant - thank you so much for sharing this, Jac! Haha yes it is a bit calorific. Not so bad if you share it round. What is this thing you call 'share'? I don't understand. Haha yes I forgot about the whole cashew nut option. I like to go for easy every time. I've not used cashews in a dessert yet. Yes, it was all pretty simple with the vegan cream cheese, caramel, biscuits and spread. I suppose the raw cheesecakes made with cashews or tofu are healthier but to hell with that. This is for a treat! Well this looks just as good as your last one and so very tempting. Love the idea of coconut caramel. I might have to check that out. Even though I've been telling myself for at least 3 years now I should try making cream form a tin of coconut milk, I still haven't done it! Pop a can of coconut milk in the fridge today Choclette, otherwise you will forget. And yes this cheesecake is very tempting. Thanks and yes it was rather sensational. Oreos are too tempting! Such a gorgeously decadent dessert! If only such indulgences didn't immediately stick to my hips, lol! Thanks and yes there is that. Best to make it when there are plenty willing to share. 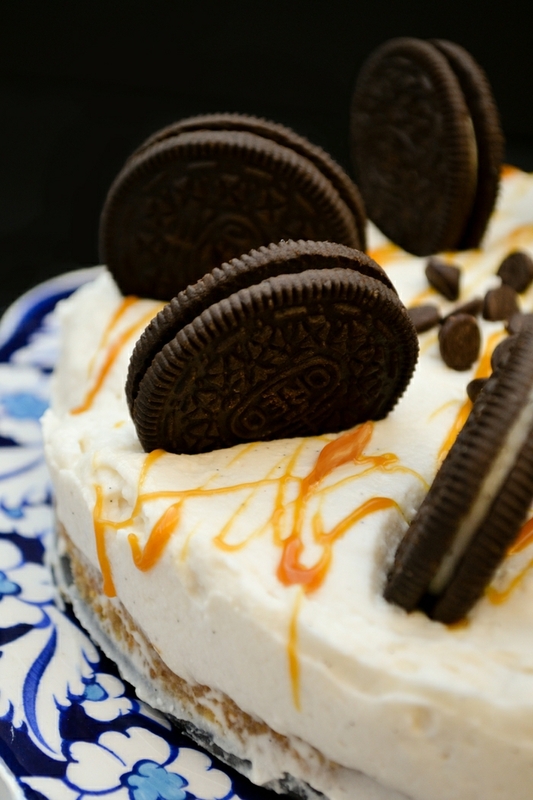 This cheesecake looks stunning! I can't believe is actually vegan, literally can't wait to try this myself! Whoa, looks like there are many things to look forward to when I become a full vegan one day. Looks lush! Haha yes, it's actually not to hard to do. Easy from a veggie diet. I think giving up cheese is the hardest part. Goodness gracious me Jac, what a gorgeous dessert!!! I'll have to make this over the holidays... it just sounds too good to miss!